I am an Anti-Socialist because I care about the fundamental requirements and needs of humanity. “The truth is: humanity requires the hope of reward and failure. That’s right. We need both.” I declare this soundbite in my speech, The Anti-Socialist. For as long as a person has the hope of reward, they will work hard to achieve something they value. With that hope of reward, a person will research what needs to be done, study it, learn it, practice it, develop it, improve it, try it, fail at it, correct it, re-try it, and perfect it. But when that hope of reward is not there even to begin with, or no longer exists, or is removed, a person will not have the inspiration to work as hard or even to try at all. Likewise, humanity needs failure too. Lessons are gained though the process: attempt, failure, learn, correct, and re-attempt. Moreover, failure teaches a person when they are doing something that is not best suited for their individual skills. For an example, an excellent artist needs to fail at trying to being a basketball star in order to teach them to instead direct their efforts on being the excellent artist they actually are. Socialism attempts to equalize outcomes. To do that, socialism removes the hope of reward and removes failure. And without these fundamental needs, human nature itself is ultimately crushed, making people to be living in hopelessness and learning mostly nothing. Yes, humanity requires both the hope of reward and failure. That is why I am an Anti-Socialist. As part of the larger project to provide tools of shareable memes to polygamy activists, the pic for this sound-bite has been posted on Pinterest. 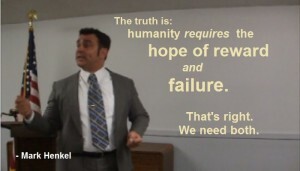 Pinterest PIC: The truth is: humanity requires the hope of reward and failure. That’s right. We need both. These three links (one to Youtube and two to Pinterest) are developed to be tools for activists to use when working to persuade and encourage others to allow freedom for polygamists.